Month 2 day 2 in game, built one bus stop and tried the transport. Also finished those island events and got the Alpha 2.0 end message. I try to write down anything interesting. 1. In character creation, hair color is still called skin color. 2. You can access commission board before getting a builder's license. Is this by design? 4. After a spar, the camera moves to weird random angles (like extremely close, directly above or below player character). Walking around or moving the mouse eventually returns camera to normal position. 5. Tody doesn't seem to fight at all in sparring. He keeps running until he loses. One time he manages to get out of the ring but I still win at timeout. Then Tody finally fights back on day 25 month 1, a rainy day lol. 6. Tody and Liuwa can get stuck at the bridge when running to Amber Island. 8. This is in Alpha 1.0 as well. Any clothes/pants need to move to character inventory (ie. not holding in hands) to equip. 9. If next day's weather is cloudy but not raining, gathering items don't respawn so I can't gather them (wood, stone, herbs, grass). I have three cloudy days in a month and the ground doesn't have any gather items on all three days. 10. Warping to exit from mine map is very nice feature. I also like how you can increase stamina limit by putting furniture in house, though digging up a sofa in a dirty mine is pretty weird. 12. Ginger's umbrella clips through her if she does the arm stretching animation. I saw it once in a fire-side meeting. 13. Presley is sitting on air now. He doesn't sit like this from the start but I forget which day he starts it. 14. I love how chickens get hostile when you pick up the little chicks lol. 15. Quests change a lot too. I like the inclusion of deadlines. It makes quests realistic. Relationship point bonus with quest giver is also nice. Nothing to complain about. 16. Can't figure out how to rotate the upgraded workbench when asked to place on grid. 17. Figuring out fishing at start breaks many lines for me. But once that's figured out, fishing is pretty easy. The rod will blink red if angle is not right and a directional cue will show up. Now I just keep reeling and never break a line again. Very fast fish will be difficult to land under current mechanics. 18. Okay this is totally personal. Music in sparring and fighting monsters are pretty tense/fast paced. I wonder if a light-hearted, funny battle theme would be suitable in a cute game like Portia. Of course serious, adrenaline rushing battle themes for bosses are totally appropriate. 19. I beat the bosses and finish the quest in one go. I like how time freezes and dining spots are there for recovery. The common enemies are easy enough and bosses don't pose too much of threat. Basically I don't bring any herbs and still stay full health until the Bandirat boss. It manages to hurt me once but it's still easy. 20. Several barrels in dungeon can move like moonwalking on the floor. 21. Starting day 1 month 2, sparring and gift options are greyed out when talking to people. I have tried loading save from Day 28 Month 1 and sleep. Then on Day 1 Month 2, those options are still greyed out. On Day 28 Month 1, sparring and gifting still work fine. 22. On Sundays, when trees respawn, sometimes the trees don't have blue life bars. Swinging an axe on these trees is like hitting air. Loading a save from previous day and sleep seems to fix this probem. I try to reproduce invincible trees by loading my save on day 28 month 1. One in several tries these trees appear lol. 23. Like the transport system. Cost a little money but works perfectly. I plan to finish all three to save my time. I think what's left is upgrading the house and assembly platform. I will keep playing to see if I can discover more interesting moments. It's been a very enjoyable playthrough. One picture for morning, noon, evening, and night. Oh really? That's awesome! 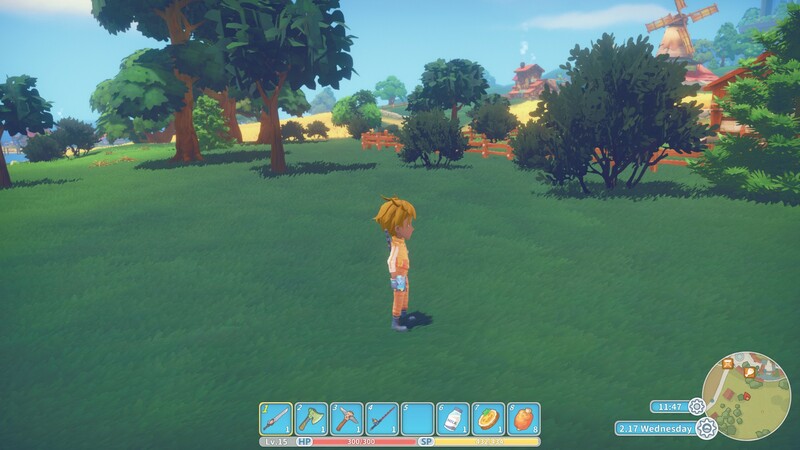 But then I am not surprised because the game's called My Time at Portia; the words "My time" sound like you tell a story about yourself, what kind of memorable things you did. I was wondering if you can take snapshots at moments of life and put them in an album. Nonetheless, camera is good news! If you have gifted or sparred with someone once in a month you'll never be able to gift or spar with them in following months. Also once you have chatted with someone you'll not gain any relationship points for chatting in following months. For me once a tree can't be chopped then I never can chop it down again. This happens on day 2.1 for the trees a stone axe can chop down, then the following Sunday, day 2.8, then some trees which require the bronze axe can't be chopped down. I think that I can only chop down the trees with lighter foliage. For your information here are all the trees that can't be chopped down around my house.